I am home. When people ask me what my “favorite stadium” has been so far I immediately disqualify Tiger Stadium and Comerica Park due to sentimentality. Tiger Stadium will most likely forever be my favorite because it was the stadium I grew up in. CoPa will probably be a close second because it is the park that I saw my first live World Series game in. I will try and stay as objective as possible, but this will be difficult. Two days off in a row. I don't know what to do with myself! This is going to be another short one today. I got a little bit of work done today (writing, recording and editing) before I left Chris and Michelle’s place. As much as I would have loved to stay with them longer, I have a couple of other friends to catch up with that I have not seen in many years. When I came up with the schedule for this tour I purposely included an extra couple of days in Detroit to meet with friends and family. As I type this I realize that I have not actually had a real “off day” in nearly three weeks. Every day since Seattle has included either a travel day or a ball game. In an effort to not run out of steam so close to the finish line, I elected to have a nice lazy day while hanging around the house in my sweatpants. 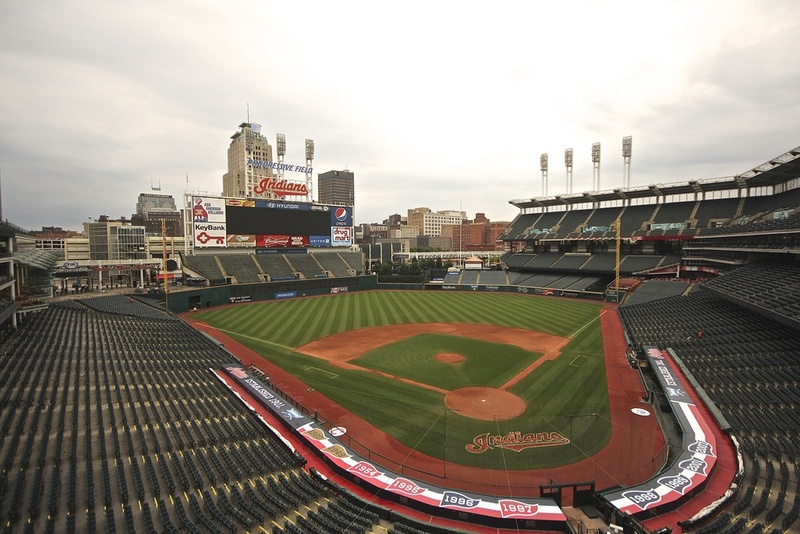 I did not have high expectations coming into the stadium formerly known as Jacobs Field, so I was pleasantly surprised at how much fun there is to be had here in Cleveland. It took them a while to warm up to me, but after a couple of innings, the amazing Indians fans embraced this humble Tigers fan and created an experience that I will never forget. Before I left for Cleveland I took a tour of Great American Ballpark and visited the Reds Hall of Fame. 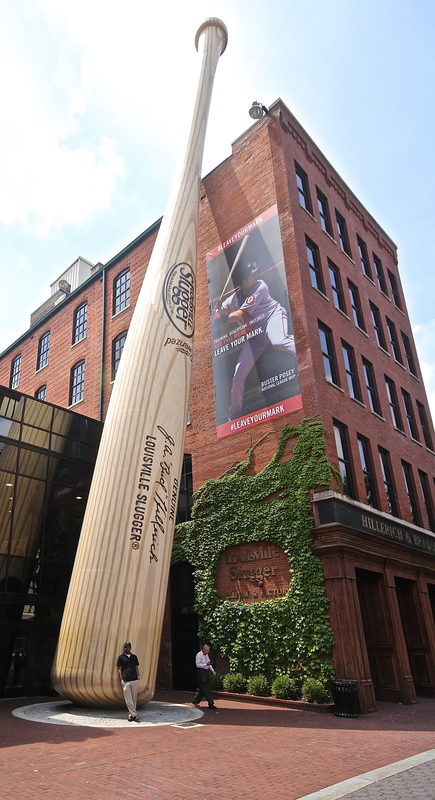 The Hall of Fame in Atlanta was fun as it showcased an old-timey train, the museum in Tampa was filled with great memorabilia of baseball's heaviest hitters and Kansas City had a great guide to teach you the history of the game. The Reds have built something truly special just outside of the ballpark gates and I am glad that I dedicated a full day to truly take in this three story monument to Cincinnati baseball. They may have taken Opening Day away from Cincinnati, but they have not taken away their love for the game. The Queen City remains one of the best baseball cities in America. The area around the ballpark is beautiful and the people I met were fantastic. Much like my experiences in almost every other stadium this summer, there was not nearly enough time to take in all of what Great American Ballpark has to offer. After a quick six hour drive to Cincinnati I relaxed in my hotel room and watched some baseball on my MLB At-Bat app. It was a lazy day for me as I am still recovering from the cross-country drive. With no major activities happening today, I will answer a question that I am asked on a daily basis. Today was the first and only time on my tour where I visited two different stadiums in a single day. I began with a tour of Wrigley Field with my sister and ended with a game at US Cellular Field with my brother-in-law. This was to be his first time inside of a Major League Baseball stadium. I know what you are thinking and no, I do not know how my sister found this guy either, but it is never too late to go to your first game and I think I made him a fan. A-Rod is back. Today was a madhouse because the circus has come to town. After my lovely day at Wrigley yesterday, it was time to head south to see the White Sox take on the Yankees. Unbeknownst to me when I scheduled this tour, my trip to U.S. Cellular Field would include the controversial return of Alex Rodriguez. This was truly a unique experience and I have the amazing people of Chicago to thank for that. I am about to make a controversial statement. I do not like Wrigley Field. Are you still reading? Good, because I was lying. Of course I love Wrigley Field, it is impossible not to. I have some minor quibbles with the friendly confines, but overall this remains one of the best ballparks on the planet. It is time for some day baseball at the second oldest stadium in the country. Come on Cubbies, let's get some runs. Before I embarked on the long and arduous drive to Chicago (roughly 90 minutes) I decided to take the early morning tour at Miller Park. The rest of my day was filled with seeing old friends and relaxing in my sister's empty apartment. The majority of my long drives are over at this point, but there is still a long way for me to go. My mother is gone, leaving me alone with the open road for the rest of this tour. Luckily the majority of the long stretches are over so I have a string of four to five hour drives to breeze through. Today was a quick five hour jaunt to Milwaukee where upon reaching, I promptly ordered some dinner and got some writing done. As this was a relatively uneventful day I will use this post to answer one of the more common questions I have gotten thus far. Today I took a tour of the park before watching the Twins drop a tough one to the Royals. My second day at Target Field ended up being more fun than my first. My fancy weather app predicted thunderstorms all night, but it could not have been a more beautiful day for a ball game. Between the tour and the game I hung out in downtown Minneapolis where I watched the uneventful trade deadline come and go from the comfort of a nice Irish Pub. There was nothing particularly special about today, but after the last couple of weeks of driving I was happy to have a nice leisurely day to enjoy some baseball. Opening in 2010, this is one of the newer ballparks in the country. After spending 27 years in the Metrodome, the Twins finally have a home stadium they can be proud of. It was an overcast day in Minneapolis, however the stands were mostly filled due to the pregame ceremony revealing the logo for the 2014 All Star Game in Minnesota. With the trade deadline looming there were rumblings in the crowd that this may be the last game Justin Morneau donned a Twins jersey. Despite this game being a matchup of two teams near the bottom of their division, there was plenty of fun to be had in this outdoor stadium. We made it to Minneapolis! We made it! My mother and I have spent 49 hours together in a car over the last week driving from Seattle to LA and then LA to Minneapolis. My efforts to take the wheel from my mom fell flat once again as she drove the bulk of the way while I sat next to her typing away. Ultimately, in addition to being grateful for the company and the respite from driving, I was able to get quite a lot of work done these past couple of days thanks to my mom's tireless dedication to taking care of her son. Today my mom and I drove from Utah to South Dakota. Another 10 plus hour drive, but this time we ended up at one of the most magnificent sights in America, Mount Rushmore. Neither my mother nor I had ever been to South Dakota, so being able to see this monument up close was very exciting for both of us. Check out the gallery for more photos of our time at Mount Rushmore.